John Gibson was born in Wales and originally trained in Liverpool, but in 1817 he left Britain for Rome, where he was to spend most of the rest of his life. He greatly admired the Neo-classical sculpture of Antonio Canova, as well as the work of the Danish sculptor Bertel Thorwaldsen. Both these artists were established in Rome at the time of Gibson's arrival, and gave him advice and assistance. Gibson nevertheless continued to exhibit work at the Royal Academy in London, and was elected a Royal Academician in 1838. During the late 18th and early 19th centuries many British artists lived in Rome, and visiting dignitaries making the Grand Tour often commissioned or bought works from them there. The Pandora epitomises Gibson's Neo-classical purity of style. 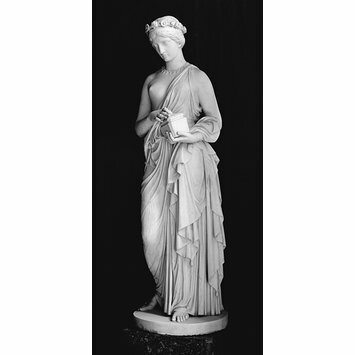 The classical subject, posture and dress, as well as the smooth surface of the marble, are all typical of his work, and reveal his debt to Canova and Thorwaldsen. Pandora is portrayed about to open the box that, according to Greek myth, released all the sorrows of the world. The gravity of her expression seems to express a sense of foreboding at what she is about to do. Gibson made more than one version of this sculpture; the Museum's example - signed 'IOANNES GIBSON ME FECIT ROMAE' - was given by a Mrs Penn, and it must therefore be the one formerly owned by a Mr Penn, mentioned in a biography of Gibson written by Lady Eastlake in 1870. Another version is at the Lady Lever Art Gallery at Port Sunlight in Merseyside. Pandora was the first woman, created by Hephaestus and Athena, on the instructions of Zeus. Each god and goddess endowed her with a special quality. Pandora was designed to bring men misfortune. In his Works and Days Hesiod recounts that Zeus sent Pandora to Epimethus, who was seduced by her beauty and made her his wife. Pandora opened the lid of a great pot (Pandora's box) which released all the ills in the world. Hope alone remained inside. In Christian thought she was seen as the pagan counterpart of Eve. Statue of a standing Pandora looking downwards, with a casket in her left hand. Marble; The red marble base has a decorated moulding in bronzed wood and a siena and black marble plinth. Signed. Bought from the sculptor by John Penn in about 1860 for probably around £700. This Pandora was offered for sale as part of the contents of the mansion, 'The Cedars', Belmont Hill, Lee, London S. E. by order of the Executors of the late Mrs. Ellen Penn, 01/07/1912-05/07/1912, Farebrothers, Ellis & Co, 29 Fleet Street, London EC, lot 634. It seems to have remained unsold, and was later given to the Museum by Mrs Constance Penn, London, in 1922.